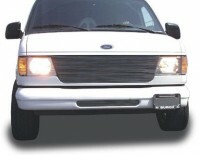 20500: 92-07 Ford Econoline Van Replacement Billet Grille. This polished billet aluminum grille has an approximate installation time of about 1/2hr and comes with complete directions and hardware. Finished in black powder coat with polished chrome face for a unique custom look. This will completely replace the original grille. Backed by manufacturers 5yr warranty. Made in USA. Tell your friends about the Replacement Billet Grille (22 Bars). Share this product on Facebook, Twitter, MySpace or send an email to a friend!